Canada has won 14 gold medals, more than any other country ever in an Olympic Winter Games. Physically, there are 69 actual gold medals (23 in men’s hockey, 23 in women’s hockey, five in curling, four in short-track men’s relay, three in speed-skating team pursuit, two in women’s bobsleigh, two in ice dancing, and seven individual gold medals) spread among 68 gold medallists, including double-gold-medallist Charles Hamelin. The 26 total medals is more than Canada has won at any previous Winter Olympics (more than any Olympics except for the boycotted 1984 Games in Los Angeles), and the third spot on the medal count behind the United States and Germany is the highest Canada has ever been in that ranking. Own the Podium may have had the unrealistic goal of Canada having more total medals than any other country, but I don’t think anyone would argue now that it wasn’t successful. Canada reached for the stars, and though it didn’t get there, if the consolation prize is a sea of gold, we’ll take it. 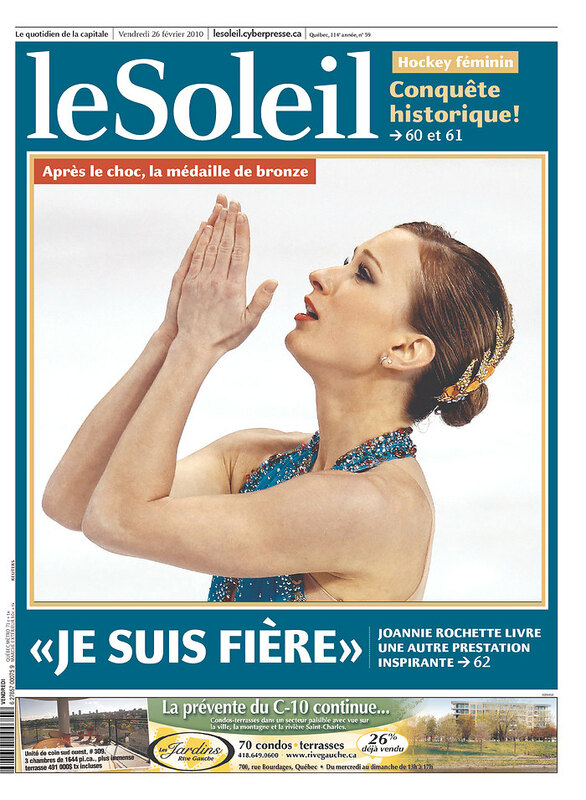 I’m sure Joannie Rochette and her family would love to save the newspapers that carried the story of her courageous and impressive bronze medal in figure skating. Fortunately the Journal de Montréal learned to spell her name properly today. They screwed it up on Wednesday’s front page after her short program. Announcements came this week about two new specialty channels that will be launched over the next month. One is Yoopa, a kids’ channel (ages 2-6) that was approved by the CRTC as “TVA Junior”. Quebecor plans to launch it April 1, and it will have some advertising, though not of the traditional kind, says Richard Therrien. The other is Zeste, a food channel set to launch March 22 by the company behind Évasion. Both are digital channels and will launch in both standard and high definition. UPDATE (Feb. 26): The CRTC has also approved TVA Sports, though it refused to step in and force RDS to give up is exclusivity contract with the Canadiens. I’ll leave the eloquent writing to the dozens of newspaper writers and columnists here and abroad working on stories. As far as I’m concerned, the numbers speak for themselves. The new version is a big change from the 90s-era design that has gone virtually unchanged since 2001. The new site also allows her to enable comments, though for now the plan is to use it sparingly. Pouncing on an opportunity left by the shutdown of CINW, CJAD has picked up the syndicated overnight program Coast to Coast AM, which used to air on 940. It will occupy the overnight hours on CJAD starting Monday, March 1. These comments were echoed in an Astral Media press release issued today. My phone and e mail have been bombarded with calls from listeners who are confused as to why i was not on air after Tuesday. Some think I am ill with a sore throat. CJAD has been swamped with calls too. Nothing like what is likely going to follow after reality sets in to my listeners that they would be listening to syndicated radio from Monday on. I hope that Coast to Coast does as much for CJAD that it did for 940 radio under the guidance of PD Chris Bury. TG Gord Sinclair didn’t have to see this time in history. Never send a boy to do a man’s job. I was watching an episode of Enquête recently in which Radio-Canada complained about what the Canadian government was doing to control information, silencing and punishing critics, getting around access to information requests, and preventing people from giving even public information to reporters without checking with the government’s communications department. All this despite having once championed the Federal Accountability Act and promising to clean up Ottawa. As I was watching it, and the eerie, sinister way it portrayed the way the government tries to control the media, I was struck by the feeling that this sounded a lot like the way an entire industry seems to conduct itself: the media. Privately (and sometimes on Facebook), many journalists will gossip about what’s going on at work just like any other employee of any other corporation whose name isn’t Apple and whose functions don’t include preserving national security. But it’s exceptionally rare that they’ll speak on the record criticizing a decision of their employer, for fear of getting reprimanded or fired. The employers, meanwhile, are more than happy to comment on the latest press release praising their latest big-budget project, but tend to be curt (if they respond at all) to questions about job cuts or anything else negative that happens. A journalist I respect told me that he’ll talk about anything but his boss. I understand the mentality. For one thing, you can’t really expect someone to be able to speak freely about their employer. It’s a conflict of interest, even if you try your best to be fair. This isn’t just journalists – people in any job should be expected to maintain a minimum of loyalty and respect. Besides, since journalists at other media are free to talk about your employer, it’s probably best to just let them do it and stay out of the way. But there are problems with this mentality. First of all, in this age of increased media convergence, the number of independent voices is shrinking, and it’s gotten to the point where you’re either part of the organization or you’re part of their direct competitor. This is a large reason why there are few media critics today, especially in the big media. Instead, you’ll find them at a few independent media outlets like Le Devoir, Voir or the mom and pop community weeklies. Or you’ll find them online, at Le Trente or right here. It’s not like people aren’t interested in what’s happening in media. This blog’s readership is evidence of that. The Gazette and CTV have started to notice that people take a keen interest in local anglo media, and so will post more stories about local radio personalities getting fired (something that’s happening very often, unfortunately), because those stories prompt a lot of comments. Devoted self-critics are even more rare. The Organization of News Ombudsmen lists three members in Canada, two work at the CBC and the other is Kathy English at the Toronto Star. That’s it. Unless one has been hiding somewhere, there is a grand total of one public editor at all of Canada’s private media. The result of that is consumer complaints about news coverage is sent to upper management, and often ignored or dismissed. People whose only real goal is to be heard feel like their news organizations don’t care about them. The problem is that as companies get bigger and more corporate-minded, they start thinking less in terms of connecting with an audience and more in terms of marketing. Decisions are made not by discussing them with the reader, listener or viewer, but by coming up with an idea and maybe running it by a focus group. Even with social media, there’s little real communication with news consumers. When CFQR canned Tasso and Suzanne, the audience revolted using social media, and the station responded by shutting down discussion on its Facebook page. Daybreak’s Facebook wall has dozens of posts by listeners complaining about Wood being taken off the air (even though she hasn’t yet), but all that’s coming back from the other side are weather forecasts and messages from researchers looking for sources to interview. And then they wonder why their ratings and subscriptions have dropped, why they can’t seem to connect with the audience. All of this is made even worse by the fact that news outlets are more than happy to criticize their competitors. Quebecor’s news outlets won’t mention the existence of Rue Frontenac, but they’ll trash La Presse or Radio-Canada, and vice-versa. Richard Martineau, who writes a column for the locked-out Journal de Montréal, was recently interviewed by Paul Arcand, shortly after Corus announced that Arcand would replace regional programming with his show, resulting in layoffs. Both explained that the controversies didn’t affect them, and while I don’t think either of them was lying, the instinct was that I couldn’t entirely believe them either. Are they both truly free to say whatever they want about their employers? I’m not calling for a free-for-all where everyone’s telling off their bosses or putting company secrets on their blogs. There are things it is perfectly understandable to demand journalists keep to themselves. When I worked at The Gazette, for example, I accepted that it would be inappropriate for me to be leaking internal documents, airing my personal employee grievances, breaking embargoes or posting office gossip. These were common sense rules like those spelled out in the CBC Blogging Manifesto and later enshrined into CBC policy. What I’m asking is for other organizations to adopt similar policies concerning journalists who use social media, since just about all of them are doing just that now. And then to allow those journalists to go out without fear of what their bosses might do if they dare to say they disagree with a decision made by their employer or say something that wasn’t first vetted through the PR department. What I’m asking is for media managers to be a little more honest with people. If you’re ditching a local radio hosts for syndicated programming, don’t say you’re improving the schedule and you’re excited to bring Ryan Seacrest to the airwaves. If you’re cutting the size of a newspaper, don’t say it’s to make it more convenient. Just say you can’t afford these luxuries anymore and you need ways to save money. Of course, increased honestly might lead people to realize that these budget cuts aren’t because the radio station or newspaper is on the brink of bankruptcy, but because the giant multibillion-dollar corporation that owns it needs to siphon off more money from its assets. And that’s where it becomes harder to justify it honestly. What I’m asking is for the media to understand that bullshitting your consumers just isn’t going to work anymore. They’re too smart to fall for it, and they’re going to look elsewhere if they don’t feel they can get the full story from you. It’s easy to say you’ll talk about anyone but your bosses. But if you can’t talk freely about your own organization, how can I trust you to talk freely about anything else? UPDATE (Feb. 27): I meant to add that this piece from David Olive is one of the rare examples of honest self-criticism I’ve seen, even if it’s taking shots at a former publisher of his paper. It was with quite a bit of fanfare last week that the Quebec Press Council announced that John Gomery would become its new president. Similar to the fanfare that came out when Gomery became the honourary somethingorother for Projet Montréal during the last municipal election campaign. Like most people whose name isn’t Jean Chrétien, I have a good deal of respect for Gomery. He’s had a long judicial career and has built up a reputation as being a man of ethics (whether or not that reputation is deserved, I don’t know). And I have no doubt that he would bring an important legal perspective to the council, and ensure that decisions are rendered fairly and transparently. Sure, Gomery also has a reputation for being a bit too friendly with the media, and maybe saying things he shouldn’t. But as someone who does that kind of thing all the time myself, I can hardly fault him for that. John Gomery is not a journalist. Admittedly, I’m only going by his Wikipedia page, but unless there’s something I’ve missed, his last job in anything close to a journalistic capacity was with the McGill Law Journal – half a century ago. That lack of experience has shown in some of the comments he’s made since he was given this new post. About how he thinks everyone should be paying for news and those who “give away” their news for free are making a mistake. About his apparent dislike for blogs written by “strange people” with no credibility. About how he thinks the best way to get private broadcasters (who left the council, prompting the departure of the previous president) to come back is to act like they’re still members and keep rendering decisions on their behalf. About how he wants to “embarrass” individual journalists for the errors they commit. While other people, including journalists, share some of these thoughts, to me they sound like the rantings of someone who has no idea how the news industry is changing and just wants kids to get off his lawn. Perhaps I’m overreacting a bit. He won’t be the only one deciding who’s right and wrong when someone makes a complaint, and having a cool-headed lawyer to balance out the journalists might make sense. Still, I can’t help feeling that Gomery is stepping into an area that sounds familiar to him but really isn’t. If Gomery is to take this new job seriously, he’s definitely going to have to do a lot of learning about how the news media works, and how they judge themselves. Until then, I won’t say I hate him, I’ll just say I’m not crazy about his appointment to the council’s presidency. Certainly not crazy enough to justify the hype. UPDATE: It’s been pointed out to me that the position of president of the Quebec Press Council is supposed to go to a non-journalist. The point is taken, and I don’t think Gomery is a bad choice for the position. But I still worry about how he thinks he knows a lot more than he really does about the industry. Like similar papers throughout the province, these are free papers heavily supported by advertising. Echo de Laval will be distributed to 120,000 homes in Laval, while the Echo de la Rive-Nord goes to 66,000 homes in Saint-Janvier, Sainte-Thérèse, Blainville, Rosemère, Boisbriand, Sainte-Anne-des-Plaines, Bois-des-Filion and Lorraine (in other words, the middle north shore). Quebecor decides on the business model for these publications, without having to worry about appeasing unions. They’ve already said the two newspapers will work together, and other processes might be in place that would make unions cringe. The launch of these papers breaks an unofficial agreement between Quebecor and Transcontinental Media to stay off each other’s turf. Transcontinental has papers all across the island of Montreal, as well as the Courrier Laval, one of its larger papers. Quebecor has papers on the south shore, meanwhile. The launch of the Echo de Laval will put the two in direct competition, during a time when that’s the last thing small newspapers want. The previous point is made worse by the fact that two of the people named in the press release used to work at Transcontinental’s Laurentians paper, Le Trait d’Union. Mario Marois, who was Trait d’Union’s publisher until recently, becomes publisher of l’Echo de Laval. Guy Crépeau, who has worked as a journalist and as ad sales supervisor for Trait d’Union, becomes the news director for both Quebecor papers. Quebecor says the two papers will add 23 jobs (Sun Media VP Charles Michaud specifies this includes seven full-time journalists and one part-time journalist). Their first issues come out Thursday. Quebecor’s press release says that “selon le nouveau modèle d’affaires de Quebecor Media, journalistes et équipes de ventes travailleront de pair au sein des deux publications.” Some have interpreted this to mean that the wall between editorial and advertising would come down at the two papers, with both sides working together. Cécile Gladel and the STIJM are already calling foul. Pas question de mélanger les genres. La publicité et la rédaction restent bien distincts l’une de l’autre. Il faut comprendre que les deux salles de rédaction travailleront de pair pour les nouvelles qui touchent les deux territoires. Ce sera d’ailleurs la même situation au niveau des ventes de publicité. Ted Bird, who left CHOM in January and has been looking for another job since, has picked up a new gig as a weekly sports commentator at CFCF, the station announced today. Bird, who since leaving the station has started up a personal blog, a Twitter account and a blog for The Gazette, will be offering his take on the world of sports during the Monday newscast at 6pm and 11:30pm (or, more accurately, during Sports Night at 11:45, head honcho Jed Kahane confirms), starting the day after the closing ceremony of the Olympics (March 1). Stories at CTV and The Gazette. CTV is pleased to announce that veteran Montreal morning man Ted Bird is returning to the airwaves as part of the city’s #1 English language Sports team. Every Monday on CTV News at 6pm & 11:30pm, Ted will weigh in with his ‘Bird’s Eye View’ on the world of sports. “I’m flattered by CTV’s confidence in me and excited about broadening my broadcast horizons into the television milieu”, said Bird. “I’m especially grateful for the opportunity to reconnect with everyone who’s taken the time to say they miss hearing my voice. Sadly, you now get the face as well”. “Ted’s quick wit and solid sports analysis have earned him a loyal following with Montrealers”, said Jed Kahane, CTV’s Director of News and Public Affairs. “We’re delighted to be able to get him back on the air with this weekly commentary”. “Bird’s Eye View” will begin airing on CTV on Monday, March 1st. UPDATE: Bird tells me this opportunity came through a lunch he had with CFCF veteran Cindy Sherwin, whom he worked with at CJFM way back when. (Let this be a lesson folks: Networking is what gets you jobs.) That led to discussions with Kahane, who decided to bring Bird on. Bird also recognizes that having a spot on the most-watched anglo newscast in Montreal will give him a lot more exposure than a blog on the Gazette website, and he laments on that blog that he’ll start to be recognized by his face as much as his voice. UPDATE (Feb. 24): CFCF is running 30-second ads promoting the new segment with Bird walking through Central Station. What is this a crudely-drawn image of? UPDATE: Clément Côté gets the answer right below: It’s the route of the 128 Saint-Laurent bus, one of the STM’s more convoluted routes.